Chaturdashi Vrat Vidhi – Procedure – Mantra – How to Perform Shiva Chaturdashi Vrat? Shiva Chaturdashi Vrat is observed a day before Amavasya or no moon day in a Hindu Lunar Calendar. The vrat is dedicated to Bhagavan Shiva. Chaturdashi Vrat Vidhi along with mantra is given below. Please note that this how to perform guide is ideal for performing puja and vrat at home. How to find Charudashi Tithi? The vrat is observed when there is Chaturdashi tithi during pradosh period. Pradosh period is the time period starting 1.5 hours before sunset. There are two chaturdashis (fourteenth day in a Hindu lunar month) in a traditional Hindu month. The chaturdashi falling before Amvas is chosen for vrat and puja. This vrat was performed by Goddess Parvati, Saraswati and Lakshmi, Mata Sita, Gayatri and Rati Devi. The Krishna Paksha Chaturdasi is also known as monthly Shivratri vrat and it is considered a favorite day of Shiva. 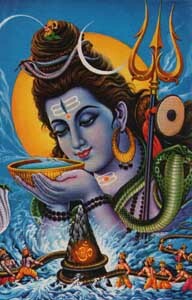 It is believed that Brahma and Shiva was worshipped Shivling during the pradosh period on a Krishna Paksha Chaturdashi. Performing the vrat will help in desire fulfillment. Tough jobs will become easy. How to Perform Chaturdashi Vrat? The fast begins morning with sunrise. It ends on next day during sunrise. Chant ‘Om Namah Shivaya’ and do the prayers in the morning. Wear white color dress on the day. If not performing complete fast, eat white color food on the day. Puja is to be performed during the pradosh period in the evening. A white Shivling is to be placed on a white color cloth. Panchopchar puja is to be performed. Light lamp using cow ghee. White kaner flower should be offered. If not available any white color flower can be used. White chandan or bhasma should applied. Three lines should be made. Chaval Kheer – Rice sweet pudding or pal payasam should be offered. The mantra ॐ त्र्यम्बकाय नमः॥ should be chanted 108 times on a Rudraksha mala. Do Jal-abhishek or pour water on Shivling for good health and for early cure of an ailment. Offer panchamrut to Shivling to make difficult task easy. It is good for those giving job interviews and exams. Keep a silver piece during puja near Shivling and after puja keep it purse or wear it as an ornament. This will help in desire fulfillment.